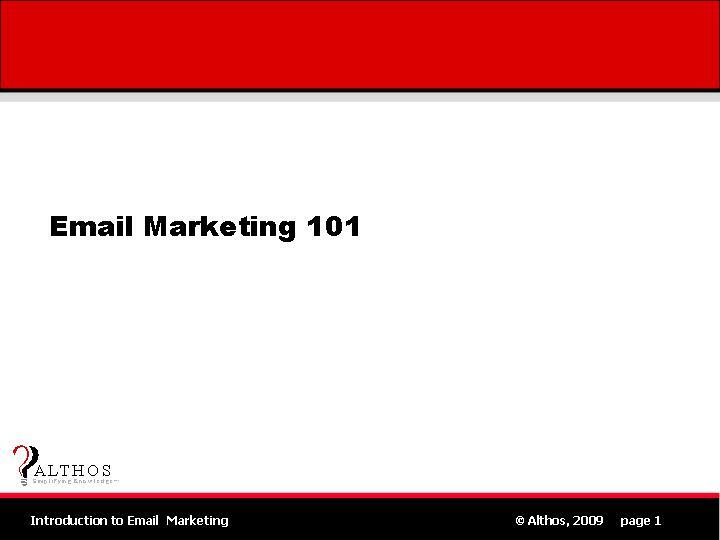 This tutorial covers how to setup, manage, and optimize email marketing programs. Readers will learn how to develop lists, create campaigns, broadcast emails, track email conversion rates, and analyze email marketing performance. This tutorial explains how email marketing systems operate, what is needed for email marketing, how to get, manage and use lists, how to create effective email marketing offers, and the regulatory requirements for operating email marketing programs. Email marketing program objectives can include increasing revenue, customer retention and communication of important information. You will learn how to focus email marketing programs to extremely targeted audiences to achieve high conversion rates. List management is critical to the success of email marketing and this tutorial explains how to find, setup and use list management companies. Explained are the key measurements used in email marketing programs including soft bounces, hard bounces, successful deliveries, opens, clicks, and conversions. Discover how to create email marketing campaigns and effective email ads and offers. Discover how to efficiently acquire and develop lists from web portals, newsletters, list rentals, and list brokers. Through an explanation of the economics of email marketing this book will includes sample costs and revenue sources. Some of the important email regulatory requirements such as the SPAM-CAN act are described, along with how you can avoid significant penalties that may be imposed for the improper use of email marketing programs. The key types of email marketing job functions are described. This book explains key email marketing program objectives, the operation of email marketing systems, how to setup and manage email campaigns, ways to tracking and analyze marketing performance, important email regulations to follow, email marketing security processes, and the types of people that are needed for email marketing programs.